Sofa-bed with pure lines shape with a design resulting in a useful, functional and beautiful object. Italian style opening system with easy opening. The mechanism place the cushions in its correct place and there is no need to remove them. The backrest keeps the pillows inside. When the sofa is open, the back becomes the headboard. 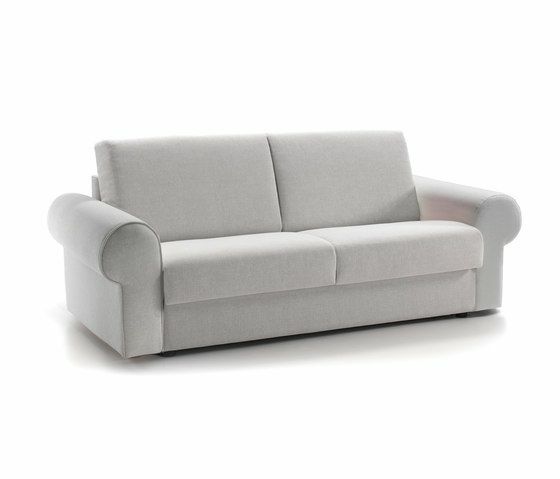 MATERIALS: – Steel frame (sofa-bed mechanism, offering quality guarantee of 5 years.) and solid wood. – Seat cushion in HR 35kg/m3 foam, covered with 3cm extra soft lay. – Backrest cushion made in 100% silicon polyester fiber. Removable cushion upholstery. Matress: Foam. Optional: Viscoelastic. – Leg p-70 chromed metal, p-25 beech wood. – Finishes: Double seams.